Mom and dad took me to happy hour at El Camino again on Friday night in Northern Liberty. It was so much fun. There were so many cool dogs to meet and a lot of people who had TWO pugs, TWO english bulldogs, TWO dogs (eh hem eh hem) and kept kissing me and hugging me. We visited Chic Petique and I tried to play with the kitty there with painted toe nails. When we were ready to go home, I ran into another frenchie named Andre! He's not a rescue but his mom knows of FBRN and says she looks on the website all the time and is particularly fond of Armani. WE all love Armani!! Mom went on and on about the rescue and how we're going to have a fundraiser in October here...Frenchie pawrents are carazy! There's a pending banner over Guinness' bio! I hope that means good news for us! He sounds like he would be a great brother for me and my pawrents would treat him like part of our family. And so does my mom. But it's okay. Because I love my mom. The fundraiser this weekend was a huge success. Lots of pawrents and their frenchies! Recap to come but I'll leave you with these pictures from the fundraiser. Why do you do this to me!?! Here is a video from Basil's birthday party. If the video above doesn't work, try this link. There are a few other videos from Basil's birthday party if you just go through my username and look for similar videos. For those city folks who can't make it to tomorrow's fundraiser, mom and I went to her work to set up some offerings for a donation. I would hate to be those people's dog..no cars! No car rides! I personally like these metal things which I can roll around in my mouth, but mom says the crunchy paper stuff is even better. She baked cupcakes to take to work. Humans there loved it. They kept saying "Oh I'm eating Arizona in Conneticut" or "I have Twiggy in Georgia".. I don't know about you but we don't eat our own kind. I sent one of my flat Basils to go with mom to work and help her set up. It was so boring there. I mean, I don't know why she'd rather be there 8 hours a day than home napping with me.. Mom even gave away her home grown vegetables. Makin' it rain! Humans are so generous when giving away paper stuff, but what about treats and table scraps??? Thank you all for the donations and support! Basil's mom (& disciplinary) here. Today, I read all sorts of information online as to how to train your dog to stop from getting all kaaraazy when the door bill rings or when someone knocks on the door. One thing I read that was interesting is that some dogs don't get all barky until they reach adolescence. Here I was blaming his cousins, but maybe it was a coincidence. It's about the same time that Basil was becoming a teenager. Goal: After one bark, we want Basil to back down away from the door. We want him to "stay" away from the door until we "release" him and then he can appropriately greet the visitor. 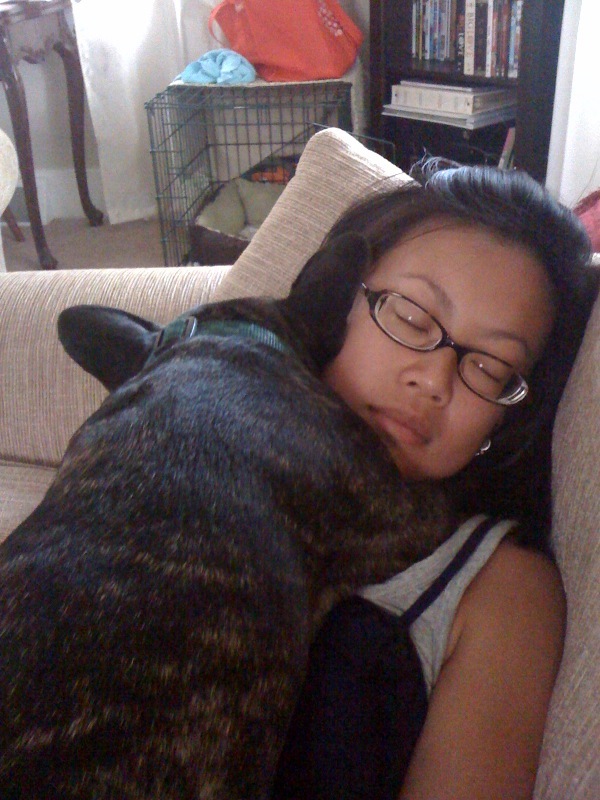 We don't want him to get into a frenzy everytime the door bell rings or if a neighbor knocks on the door. One difficulty is that we really didn't train him to "stay" very well so we need to work on that. Treats: I didn't understand the whole giving him a treat thing at the door. That to me sounded like you're reinforcing the undesired behavior. Then I read that you treat him when he is quiet and calm. Use little pieces of dry food or training treats. Today, we started with knocking on the door. That seemed to be the less severe of the two. I did as I the information I read online. I sat with Basil and ignored the undesired behavior. 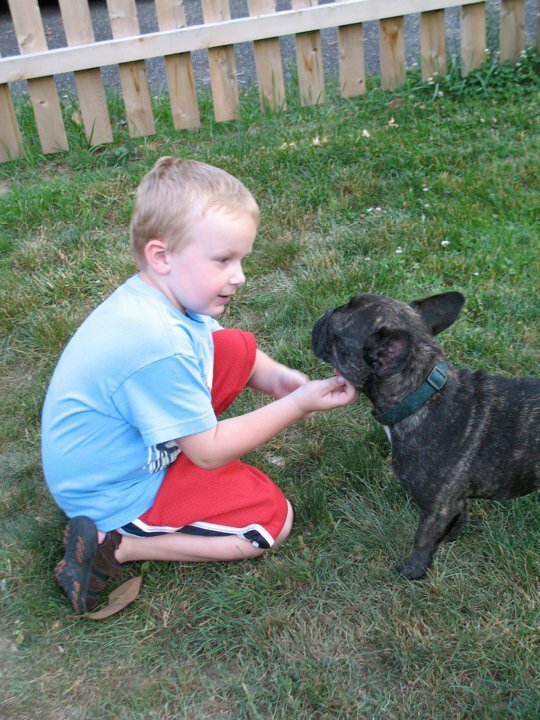 When he was quiet, praise him for being "good quiet" and then give him a treat immediately. Keep repeating. Keith kept knocking at the door every 20 seconds or so and I would just keep praising Basil when he was quiet. If Basil ran to the door, I would gently and in a calm voice call him to come back to me and away from the door. If he barks, acknowledge and thank him for lettting you know that someone is there, and then point him away from the door. We changed up the severity of the knocking but always knocked the same way ie. "knock knock knock" as most the neighbors do. The treats seemed to distract him enough that he didn't care as much about the knocking after a while. I could tell he acknowledged the knocking but then immediately looked to me for the treat and stayed sitting. Excellent! We will keep doing this for another couple of days (Basil picks things up pretty fast). Does your dog get all caarraaazy when the door bell rings? Do you have any other tips? Mom, Dad and I have been working hard to prepare for this weekend's event to raise funds for FBRN and awareness for my dear frogs. Volunteers including Ellie Mae and Mr. Gibb's parents are getting together to raise funds for the French Bulldog Rescue Network. Bill’s Wonderland of Pets in Magnolia, NJ will be graciously hosting us on Sunday July 25th starting at 11:00 AM. Bill’s Wonderland of Pets is located at 804 White Horse Pike in Magnolia, NJ. Take the LAWNSIDE/BERLIN exit off I-295. See Map here. There are going to be some AMAZING items for sale for both dogs and dog lovers. There will be homemade dog treats and dog accessories for sale. There will be custom jewelry, vintage frenchie (and pug) stuff, hand crafted cards and clothing for sale. My mom and Ellie Mae's mom have a photo shoot set up so you can even take a photo with your pawrents for a donation. 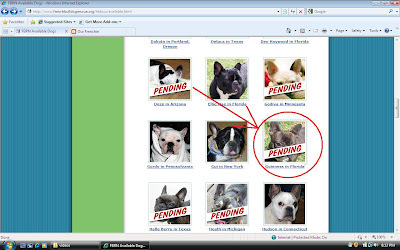 Also, look for the French Bulldog Rescue Network on Facebook or visit http://www.frenchbulldogrescue.org/ Even if you can't make it to the event, please consider making a donation to one of our foster or hospice frogs. 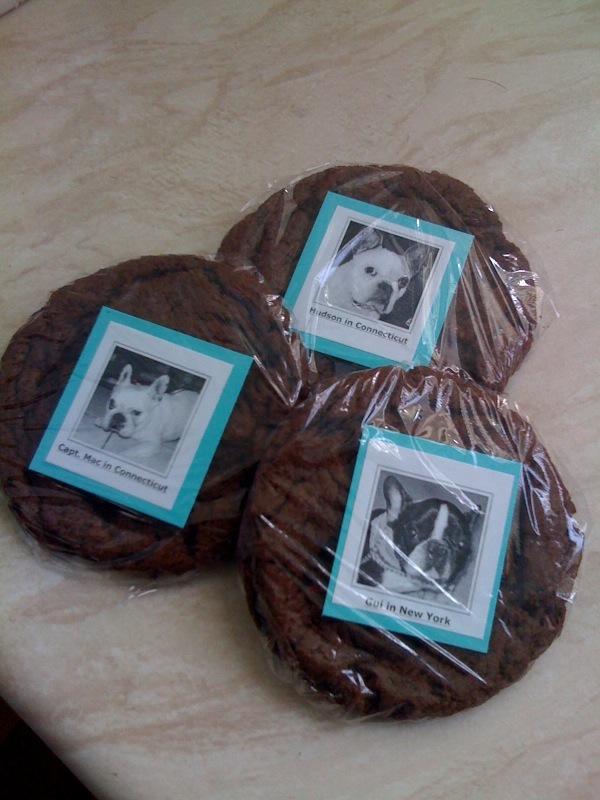 Featured on these cookies are the Hudson, Captn Mac and Gui. We had the pleasure of meeting Capt Mac and Basil was his foster mate for some time. It would be great if you could find them a home. I mentioned how Basil doesn't like the sound of paper. When I read and flip a page, he gets very startled and begins barking and he's on edge. I always thought that I just startled him while he napped on my lap. After that I realized why he didn't like the sound of paper. :( Being that he's a rescue and we don't know his full history I wonder if Basil got hit with a paper in his past life. Makes me so sad. So to turn things around, I got out a bunch of small training treats. I sat with him and crunched paper and rubbed the paper in between my fingers over and over while I gave him little treats. Since then he hasn't jumped once at the sound of paper. Basil weighs 25.6 lbs, so he's 1.1 lbs over his average. It's probably because he doesn't get as much exercise as usual since it's been so hot outside. We play with him in the house every evening trying to get him to run back and forth. I take every opportunity to walk him at night if it's not too hot. At his last vet checkup, the vet says he's doing great and there is nothing else we can do better. Knock on wood - he hasn't had any rashes or itchie break outs in 10 months. Only recently, he's been itching his groin area rubbing his belly against the carpet. That's the most itchy that I have seen him in all this time. It's probably the heat and the crunchy grass outside. We still bathe him once a week and that seems to help most. We don't want to give him allergy medicine. He's still doesn't love the bath or any water (even the rain). But he's very good in the bathtub and after a bath he's so happy and plays and plays. Basil's auntie Sugar loves the baby pool so I hope to get them together and have Sugar teach Basil that the cool water in a baby pool on a summer day can be a wonderful thing. We're still scared to cut his nails (for fear of cutting too deep since his nails are so black), so we bring him to the vet almost every month. It's one thing or another. His ears get pretty dirty. We clean them often but I also read you're not supposed to clean them more than 3 times a week. Do all frenchies get such dirty ears? Latest: It's been a while since I have taught Basil anything really new. He knows "mommy" and "daddy". If Keith asks him, "Do you want to go pick up mommy?" he runs to the door and then to the car. If I ask Basil, "Where is daddy?" he looks around and runs to Keith's office. I'm taking a class at night in Center City Philadelphia and Keith brings Basil to pick me up at night. Basil is so fascinated by the lights of the city. Things to work on: Basil learned barking at the door from his cousin. It's gotten worse and worse. He never used to care about the door. Then it became a jump and a bark. Now it's getting to be this more ferocious sounding bark and he's fixated on the person on the other side of the door. 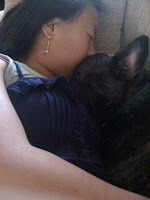 I watched Cesar Millan's tips. One week soon we're going to take turns knocking on the door and nipping that one in the bud. Also, if it's not too hot I'm going to bring Basil to the local softball games in our neighborhood. I think it's another great to get him socialized to a crowd. I consider him to be very well socialized but I think a crowd does overwhelm him and he starts getting barky. I just want to make sure he's socialized and not being anxious. If he's obviously overwhelmed, I'll take him home. He's gettin' fresh now that he's a teenager. But he's still mommy's little boy! Some of my favorite moments is when Basil falls asleep in my arms. I was so exhausted from my date with Ellie Mae and Domino that I told Flat Basil to go to NYC with mom instead. It's a good thing because it was HOT! While I strolled in Central Park Imet another frenchie. What a handsome fellow if I say so myself. His mom said I was cute too. He even sniffed my behind and I'm not even a real dog! So cute! I hope I get a brother like him. I had a hot date with Ellie Mae on Friday night. Ellie Mae was also adopted from FBRN by her mom and dad who live nearby. My mom called her mom to ask if it was okay that I court her. 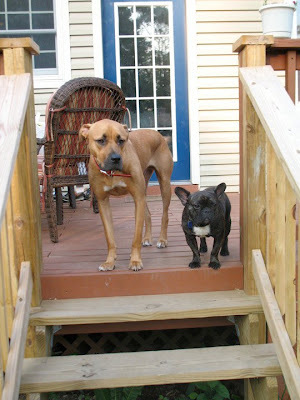 She said it was okay as long as her brother Domino the boxer came along as chaperone. Hi Ellie Mae. I love your collar. (Always compliment the ladies.) Welcome to our home. I made her a steak dinner. She seemed to really like it. Then we ran around, played with my toys, wrastled, ran around some more. It was so much fun! Then I spent the rest of the night playing with Domino. He's so much fun. We wrastled and played alllll night! Ellie Mae was pretty hot (literally) and so we took a break and relaxed together on the cool tile floor. Over July 4th weekend, I spent the weekend with my cousins down at the shore. My auntie Sugar and I played a lot together that weekend. Well, mom packed my stuff and brought my favorite steak chewie which was a gift from Mr. Gibbs on my birfday. Ahh, do I love that steak! Tastes like delicious bacon. Well, guess who else liked it? Auntie Sugar. She nabbed my steak while I was getting rubs from dad. I didn't mind...at first. I watched as she chewed on my delicious steak. I can only imagine the bacon flavored slober going down her throat instead of mine. Gently I nudged "May I I I have it .... back .... puleease?" I didn't mean to look like a wimp or anything, but I really love that steak and I was afraid she would eat it all. I nuzzled and sniffed and kissed her on the head. She looks like she could be Basil's sister! This frenchie sister would like a brother like me. What do you think? She sure is cute, but I prefer a brother to play with. Over Memorial Day weekend, we went to Montreal, Canada with Flat Basil. We did some research to see if we could bring Basil with us, but since we were afraid we couldn't cross the border with him we decided to let him sleep over his buddy Cooper's house. What a handsome photo! Cooper's mom told me that they had such a blast together. They were real buddies and Cooper missed Basil so much. He was upset for a week and would always look for Basil. Cooper's cousin J loved Basil too. He is at a great age for a dog like Basil. We felt guilty that we didn't bring Basil us on our getaway, but it worked out well. Basil had a much better time at Cooper's house instead of a long, hot car ride where he would spend his day at a strange hotel. We read something interesting about pitbulls being illegal in Toronto and that any dog with bull dog traits (even though they are a different breed) would be considered illegal because based on their traits they can fall into the "pitbull category". For information about visiting Canada with a pet, go to their website. Have you ever traveled out of the country with your pets? What provisions do you have to make regarding going through customs? What other things do you have to think about when traveling far from home with your pet? Hope you all had a blast! I sure did down at the shore with my pawrents and all my cousins! It's great being me. I get to be in two places at once. Last weekend, to celebrate dad's birthday we took a trip down south to Nawlins'! Getting ready for my trip, I studied up on things to see and do. While were there I got to ride the street car and hang my head outside. The least favorite part of my trip was when mom and dad brought me here. See how I'm hiding. To see more of my trip, go here to see the entire album.